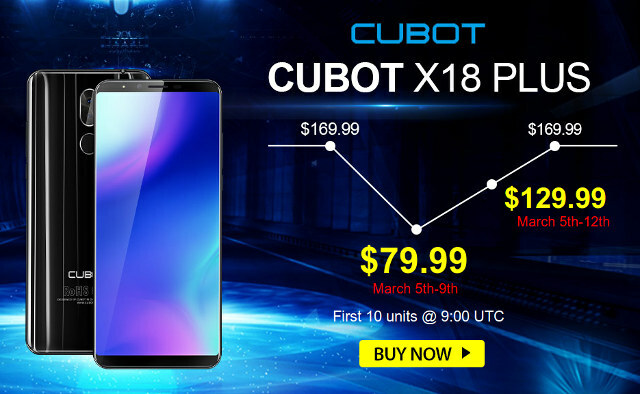 If you are on the lookout for an inexpensive 4G phone, Cubox X18 Plus smartphone with a Mediatek MT6750T processor running Android 8.0, a 6″ display, 4GB RAM, and 64GB flash may be worth a look as GearBest offers the device for as low as $79.99 shipped. The trick is that it is a flash sale with only the first 10 units sold at 9:00 UTC on March 5-9 (50 units in total), so you’d have to be fast and lucky to get it at that price. If you miss the flash sale, promo price is $129.99 until March 12. The phone runs Android 8.0, and ships with a power adapter, a USB cable, and back case. In case you don’t usually enjoy the frustration associated with flash sales, but still wants a cheap 4G smartphone, Geotel Note 4G could be an alternative for $80.99 shipped on Aliexpress. The specifications are not quite as good though, since you’d be limited to a Mediatek quad core processor, 3GB RAM, 16GB flash, a 720p display, standard rear and front-facing cameras, and the older Android 6.0 operating system. The Geotel phone has close to 250 orders, and feedback from users is usually good considering the price.